(PhysOrg.com) -- Sometimes knowing that a new technology works is not enough. You also must know why it works to get marketplace acceptance. New information from the National Institute of Standards and Technology (NIST) about how layered switching devices for novel computer memory systems work, for example, may now allow these structures to come to market sooner, helping bring about faster, lower-powered computers. Switches based on transition-metal oxides have great potential as memory devices that retain their information even when the power is turned off. One type is made by stacking four different materials: a layer of copper and one of a metal oxide sandwiched between two metal layers that act as electrodes. Such systems can act as an on/off switch when a voltage is applied between the electrodes, but just why they behave as they do is a matter of debate. Types of nonvolatile memory already existthumb drives make use of itbut they do not yet perform well enough to function as the working memory of a computers central processor. If metal oxides can be perfected for this use, they could enable computers that boot up in seconds and use far less energy. To study the switching mechanism, the NIST research team built its own version, but with a twist: They used ferromagnetic metals for the electrodes instead of the nonmagnetic metals typically used. They found that when an electric field is applied between the ferromagnetic electrodes, it causes the formation of tiny copper filaments that stretch through the metal-oxide layer. The filaments, about 16 nm long, are created or annihilated depending on the direction of the applied voltage through the electrodes, making or breaking the switch connection. The presence of such filaments is the only explanation that makes any sense as to why our structures make such good switches, says Curt Richter of NISTs Semiconductor Electronics Division. One key to the teams discovery was their use of the physics of spina quantum property of electrons that has two possible values, either up or down. 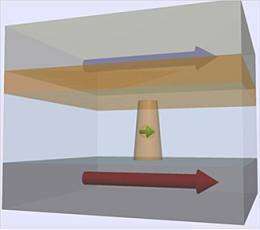 From the top electrode, the team sent a current made of electrons that had a polarized spin state, and they found that their spin state had not changed by the time the electrons reached the bottom. More information: H.-J. Jang, et al. Spin transport in memristive devices. Applied Physics Letters 100, 043510 (2012). DOI:10.1063/1.3679114, published online 26 January 2012.